Yesterday, the 6th Annual SFR Galaxy Awards were announced. What a great day! 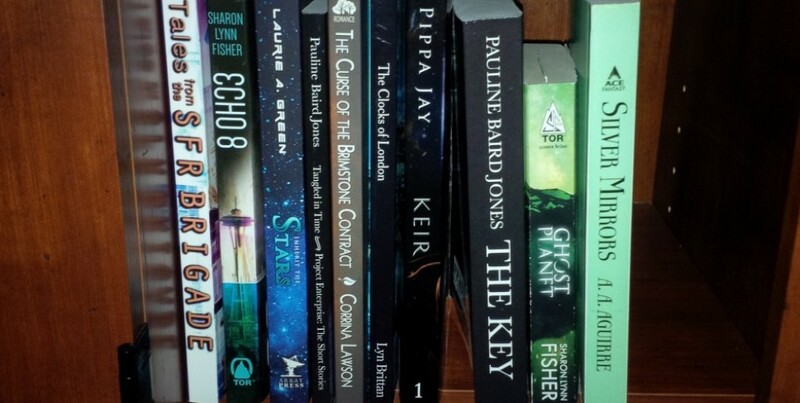 Not just for the winners, but for any fan of the SciFi Romance genre. So many great books, not nearly enough time! I am a judge for these awards, so today’s post will be my winners. Click on the book cover if you want to purchase at Amazon. Click on ‘My Review’ to get more details on what I thought about the book. At the end of this post, I will include links to all the winners and I hope you will check everyone of them out! If you follow this blog, you know that I enjoy a variety of genres. But if you really follow this blog, you know that Scifi is my favorite. And if romance is part of the story, so much the better. That is why the SFR Galaxy Awards are one of my favorite awards. These awards were created in 2012 in order to recognize standout SciFi Romance stories. But here is the best part. It is not just one best story, but an abundance of really great stories! You may wonder how a book is picked for a Galaxy Award. I happen to be a judge, so I can tell you that. Several judges, avid SciFi Romance readers and bloggers, pick them. It’s a bit arbitrary, yes, but the judges have such a wide array of personal interests, that the awards end up including something for everyone that loves the genre. The specific awards change from year to year, depending upon exactly what stood out to the judge who picked it. For example, one of my picks won the award for Best Zombie Book for People Who Don’t Read Zombie Books. In each case, the award is based on some element of the story that stood out to me, but, and this is important, each book is a remarkable work of fiction and one of my favorites reads of 2016. It is really hard to narrow the list to only five books. I’m not the type of person who can easily pick a favorite. I have to have several favorites. Here are the books that were my award winners. After this list, you will find links for the SFR Galaxy Awards. I hope you will visit all six rounds of the 2016 awards – there are so many great titles! Okay, it’s not really a zombie book but there are zombies in it. This post-apocalyptic tale of humans, wargs and zombies is such a great story that even someone who does not read zombie books (me) can really get into it. I even shy away from post-apocalyptic stories, but this is one well-imagined story. I sympathized with the heroine, Riley and cheered for the not quite human hero Luc as they fought their way through the wasteland and monsters. Bec McMaster is an awesome storyteller. Nobody’s Hero also gets special recognition for the heroine’s most engaging character name. The best thing about The Rule of Luck is Alexei. You can call him the hero, the Russian, a business tycoon or maybe even top ranking family member of an organized, er, crime family. Is he a good guy? Is he a bad guy? I don’t really know. He has many aspects, and I feel there is much more to him that was not laid out in the first book of this new series. Also, there is that luck thing. Word is, that it is in the genes. Very interesting…..
Another cool thing about this series: Book 2, The Chaos of Luck, just came out. Pets in Space would also qualify as the most highly anticipated book for me. From the moment I heard about it, I knew I would love it. Every story in the collection is a good one. Why? Well, scifi romance. Duh! But really, the fact that every story also had a pet – cat, dog, robot, dragon, or otherworldly creature – is the true appeal to me and likely to anyone who is an animal lover. If you have had one or more of these special creatures in your life, Pets in Space will appeal to you. There may have been a pet-centric passage or two that caused my vision to blur. Early proceeds from the sale of this book supported the charity Hero-Dogs.org, which provides service animals to veterans. Just another reason to put this book in the ‘remarkable’ category. Aliens are abducting people of earth for slave labor. But luckily there are people who are working to save them. Rayna and Sam are great characters that showed up in the first two books of the series. Fools Rush In takes a step back and tells the story that brought them together. There is something about this couple. They are two very different people, but they make a connection. And let me just say that connection is hot! Rayna and Sam also get my vote for best SFR couple! I decided to make this multiple choice to avoid spoilers. Multiple answers may be correct. If you want to check out more award winners, follow the links that follow. While you are there, I encourage you to check out the Judges page. You might find some additional cool blogs to follow. May you find many great books to read!